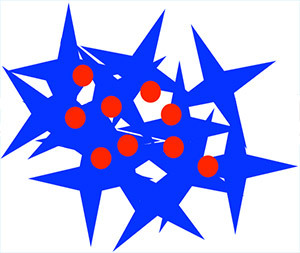 Tumors secrete enzymes the slice open peptide coatings (blue) that help to safely deliver an anti-cancer drug (red). “We can start with a small molecule and build that into a nanoscale carrier that can seek out a tumor and deliver a payload of drug,” said Cassandra Callmann, a graduate student in chemistry and biochemistry at the University of California, San Diego, and first author of the report published in the journal Advanced Materials July 14. The system takes advantage of a class enzymes called matrix metalloproteinases that many cancers make in abundance. MMPs chew through membranes, allowing cancer cells to escape to colonize other regions of the body, often with deadly consequences. Callmann created tiny spheres packed with the anti-cancer drug paclitaxel (also known by the trade names Taxol and Onxal) and coated with a peptide shell. MMPs tear up that shell, releasing the drug. The shell fragments form a ragged mesh that holds the drug molecules near the tumor. The work, led by Nathan Gianneschi a professor of chemistry and biochemisty at UC San Diego, builds on his group’s earlier sucess using a similar strategy to mark tumors for both diagnosis and precise surgical removal. To package the drug into the spheres, Callmann had to add chemical handles. As it turns out, a group of atoms essential to the drug molecule’s effectiveness, and also toxicity, made for a good attachment point. That means the drug was inactivated as it flowed through the circulatory system until it reached the tumor. The protection allowed the researchers to safely give a dose 16 times higher than they could with the formulation now used in cancer clinics, in a test in mice with grafted in fibrosarcoma tumors. In additional preliminary tests, Callmann and colleagues were able to halt the growth of the tumors for a least two weeks, using a single lower dose of the drug. In mice treated with the nanoparticles coated with peptides that are impervious to MMPs or given saline, the tumors grew to lethal sizes within that time. Additional authors include Matthew Thompson in Gianneschi’s chemistry research group and Christopher Barback, David Hall and Robert Mattrey in UC San Diego’s Moores Cancer Center. All animal procedures were approved by UC San Diego’s institution animal care and use committee. Callmann holds a fellowship through the Cancer Researchers in Nanotechnology Program at UC San Diego. The National Institute of Biomedical Imaging and Bioengineering provided financial support. This novel approach to using enzyme-directed assembly of particle theranostics (EDAPT) is patent pending. Skip Cynar, scynar@ucsd.edu, in UC San Diego’s technology transfer office can provide information about commercial development.